Boy Scouts will do a lot of things for the first time. It could be the first time tying a bowline, or the first time climbing a wall, or the first time away from home for a whole weekend. Even adult leaders will do many new things for the first time. Most of the time these “first times” are so enjoyable that the boys cannot wait for the “second time”. I have been surprised when Scouting introduces the boys to a game that they have never played even though it has been around for generations. It makes me think that sometimes the boys need to get out of the house more often. For example, I have been playing disc golf for decades. I find it to be fun, challenging, and a great way to get some exercise. The first time I suggested to the troop that we play disc golf at summer camp I received quite a few “what are you talking about?” expressions from the boys. I explained the rules to the Scouts and we have been playing the game ever since. 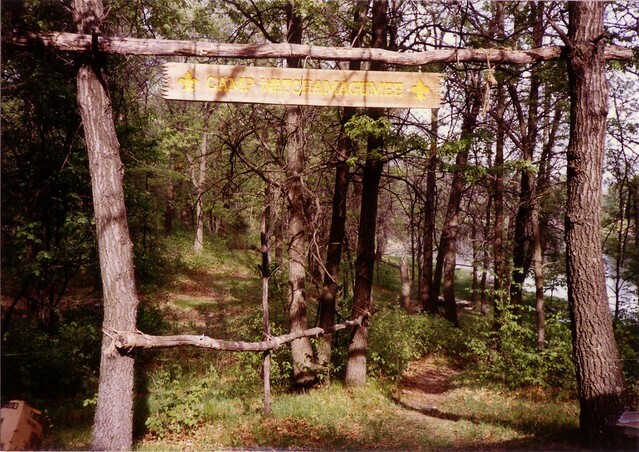 Two Boy Scout camps that we attend, Camp Stearns and Many Point Scout Camp, have disc golf courses. If we spend a weekend somewhere without a course we will create our own. Last year, we played nine holes in the winter while wearing snowshoes. It was the first time many of us had worn snowshoes. Another “first time” game was while the troop was staying at Camp Stearns one winter weekend. I suggested to the boys that we play broomball. The Scouts had never heard of the game but were willing to give it a try. They had a great time playing it and it is now a part of our winter outing every year. As a scoutmaster, I always enjoy the moments when I have a chance to introduce the Boy Scouts to something new. When you look back at your own Scouting career, what were some of the games that you introduced to your Boy Scouts for the first time? 100 Days Of Scouting: Day 25. When I typed “Boy Scout” into the iTunes search box it came up with 21 apps for the iPod Touch and iPhone, but only seven for the iPad. There were only five iPhone apps for “Cub Scout” and three for the iPad. Type “Scouting” into the search and you get apps for Boy Scouting and sports. When you narrow it down to just Boy Scout or Cub Scout apps we have ten for the iPhone and four for the iPad. Two Cub Scout based iPad apps that caught my eye were “Pack Badges” ($3.99) and “Pinewood Derby” ($1.99). The Pack Badges app allows you to track advancement requirements for the Cub Scout awards and several special awards, and it allows you to track multiple Scouts. It has received a 4.5 star rating from its users. The Pinewood Derby game app allows you to build a Pinewood Derby car and then race it. There seems to be some problems with it though. Users only gave it a two star rating and complain about it crashing a lot. Two Boy Scout related apps that caught my attention were “Camping Manual” ($2.99) and “Troop Badges” ($5.99). The Camping Manual app is exactly what it says. It is a manual with lots of all season camping tips. It has not yet been rated enough by its users to earn an average. Troop Badges is similar to Pack Badges in that it allows you to track multiple Boy Scouts through their advancement progress. It has earned a four star rating. I have not used any of these apps, yet. I would like to hear from those of you who have. Are they worth the money? Should I download them when I finally purchase an iPad? Do you have a favorite Scouting app that I have not listed? Has the BSA produced any iPad apps yet? Let me know. I would guess that Capture The Flag has been a popular game among Boy Scouts since the beginning of the Scouting program. I do not recall playing it as a youth so when I discovered the game in a Scouting game book I introduced it to the troop. Since that first game in the 1980’s it has become one of the most popular games to play while we are camping, especially when we go to Camp Watchamagumee. I am not going to go into all the rules of Capture the Flag, but it involves two teams chasing each other through the woods while trying to find the other team’s flag. It is a great game for getting the boys to burn off some energy. Being 50 now I prefer to sit in my lawn chair and watch the boys run by, but in my younger days the other adults and I would play with the boys. There is one particular game that I will always remember playing. The game took place one fine afternoon at Camp Watchamagumee. The side boundaries were formed by a beaver pond on one side and the top of bunker hill on the other. The road into camp was the end of one territory, the stream marked the end of the other. The dividing line was the path from the beaver pond to the campsite on bunker hill. One territory was completed wooded, but the other one had a small swampy pond in the middle of it. Once the boys had divided into two teams Dave, the assistant scoutmaster, and I joined opposing sides. He joined the team with the swamp pond in its territory. The game was going well. Everyone was having fun. I ran into the other team’s side once again to find their flag. Suddenly, Dave appeared between me and the safety of my side. He ran toward me, planning to catch me and put me in “jail”. I had no intention of being caught so I took off running, away from my territory and safety. I ran toward the swampy pond. Dave was not far behind me when I reached the edge of the swamp. I did not have any time to think about it or react. I ran into the swampy pond. I thought that Dave would not follow me into the pond. I also thought that the water would only be about a foot deep. I was wrong on both accounts! The water was nearly to my waist after only a dozen steps or so. It was too late to change my mind, especially since Dave had decided to follow me into the swamp. We both ran through the pond, losing speed and energy as we drenched ourselves. When I reached the other side I noticed that it was uphill to the road, the end of this side. I was getting tired but I summoned another burst of energy and ran up the hill. I planned to get to the road, run along side it for a short distance, then run down the hill on dry land back to my team’s territory, safety, and a quick rest. Unfortunately, Dave was determined to catch me. He followed me up the hill, along the road, and down the path. Our wet clothes and water filled shoes were weighing us down. But he would not give up! I was half way back to the safety of my territory when my adrenaline finally gave out. I slowed to a walk. Dave caught up with me about three steps later. He grabbed my arm, and through deep breaths said, “Caught. Caught. Caught.” I was going to jail. As he was leading me to the tree stump that was the jail he turned to me and said that if I had taken only a few more steps he was going to let me run free. He had also reached the end of his energy. To many of the Boy Scouts who have played Dungeons and Dragons (D&D) in my fictional world of Tenne the countries of Givemea, Acirema, and Minta are almost as real as Brazil, Germany, and Egypt. They know the cities of Givemea, Pleasantville, and Dogrum almost as well as Sauk Centre, St. Cloud, or Duluth. Games have been played in the forest, the desert, the plains, and the mountains. When a new player begins playing I will usually start him out with a human character. Once he has joined in several games and learned the basics of the game he may chose to create another character of a different race. Elves and half-elves have been the most popular, but there have been dwarves, halflings, and gnomes. There have even been a couple half-orcs. My world is based on the first edition books so there are probably fewer races available to players then the current fourth edition books. One feature of Dungeons and Dragons that I like as both a gamemaster and a scoutmaster is that the boys usually have to work together as a team to accomplish the game’s objective. They have to help each other battle the monsters. They have to brainstorm ideas to solve the riddles and traps. They need to protect each other through many situations. Sometimes I like to add a special theme to a game to see how the boys will react in different circumstances. Some of those topics have included racism, chauvinism, homeless children, and slavery. It has been interesting to see how they handle these topics. It has been fun to watch the development of villains in my world. Most of them only last for one game, but two villains have become legendary. Brutus, the human, and Gary, the green dragon, are villains that were designed to be in only one game but somehow became bigger, badder, and more villainous. Each became so powerful through various games that each were around for nearly a year’s worth of games before they were finally defeated. Several of the boys have taken the time to write stories based on their character’s adventures. Those stories have been posted to a subsection of our troop’s website and to a special forum that has recently been created so the boys can post the stories themselves. The stories can be found HERE (site) or HERE (forum). Take a moment to read them. The boys have written them from their characters point of view. I was nineteen when I was introduced to a roll playing game called Dungeons and Dragons (D&D). A couple of my high school friends and I would get together on weekend when we were home from college and play a game at Chuck’s house. He had been introduced to the game by his college friends and he was eager to introduce this world of fantasy role play to Neil and me. We had a great time hanging out with each other during those games. After I became an adult leader of Boy Scout Troop 68 I wondered if the Scouts would be interested in playing D&D. I talked to a few of them and they thought it sounded like fun, so I learned how to be a dungeon master (game master) and began to create dungeons and a world they could explore. I will never forget the first game I hosted. Two of the Boy Scouts played. We created their characters and began the game, which only lasted for fifteen minutes before those characters were killed by monsters. I learned a lot about being a game master during that short time. I had managed the game by the rule books. I needed to use the books more as guidelines and fit them to the gameplay. Once I began doing that the games lasted longer and they were more fun. More boys wanted to get in on the action. Nearly 100 boys have played in my world during the last thirty years. The realm of Tenne, the world of my D&D games, has grown to have quite a history. While many games are the simple explore the dungeon variety, there have been quite a few quests and other types of adventures. Villains have come and gone, giants fought, and dragons killed. There have even been wars between countries and gods. Some of the player’s characters have become legendary. Some of the games have become a part of the lore of Tenne, passed down from one group of players to the next. To this day I am still amazed at how the boys, and sometimes myself, can get caught up in the game. They become very attached to their characters. They can recall events from past games that I have completely forgotten. When the guys who played in the 1980’s get together, they talk about their games with such clarity that it almost seems like it was a Scout camping trip they attended. Many of them still have their character sheets just in case they get the call to play again when they come back to town. Most of the D&D games I host begin at 6:30 in the evening and end near midnight. Of course, there have been shorter games and some that last quite long. The longest game was a twelve hour marathon. We all got so caught up in the adventure that no one was watching the time. Sometimes I have to remind the Boy Scouts that D&D is not a part of the Scouting program, but I have been known to use the promise of a game as incentive to get the patrol or troop to earn advancement or complete a project well. There have been many times while sitting around a campfire that the boys have discussed past games and strategies for future games.